Some people absolutely insist their cranberries come out of a can, preferably with the little ridges that serve as cutting guides. So it only makes sense to put canned cranberry sauce on the Thanksgiving table if that’s what it takes to keep peace in the family. At our house, though, fresh is the only choice. These delightfully tart little berries are the perfect counterpoint to the heavy carbs and – let’s admit it – often boring turkey at the heart of a traditional Thanksgiving dinner. What’s more, they’re loaded with antioxidants and are only in season during the holidays. It would be a shame not to make the most of them when they’re here. For ages, I’ve chopped up a fresh relish in the food processor with a bag of cranberries, an orange, just enough sugar to take the edge off the tartness and a handful of walnuts. It’s simple, quick, and can be made ahead and stored in the refrigerator – a good thing at the holidays. This year, I’ve been experimenting with chutney, which is almost as easy and even more lively in flavor. Think of it as a chunky cross between jam and pickles, balancing sweet, sour and savory elements with aromatic spices. Since chutney can be made with almost any fruit, I pulled a bunch of old recipes out of my files and began combining flavors. In the end, I settled on pear, golden raisins and onions for the base with star anise, ginger and cinnamon as the accents. You could substitute cloves or allspice berries if you can’t find star anise. An optional sprinkling of red pepper flakes adds a nice bit of heat. This chutney will be terrific on the Thanksgiving table, but it may be even better with the leftovers. I can’t wait to put it on a turkey sandwich. If there’s any left over, you can serve it with a round of brie at a holiday open house. With all the vinegar and sugar, it should keep for a week or more in the fridge. If you pack it hot into sterilized canning jars and seal them tightly, the chutney will hold even longer. Just refrigerate the jars, unless you want to process them in a hot water bath, which is a lot more work. Warm oil in a large skillet over medium heat, add onion and saute for 3-4 minutes, until soft. Add vinegar, sugars, star anise, cinnamon, ginger and orange zest and bring to a boil. Add pear, golden raisins and cranberries and bring liquid back to a rapid simmer, adjusting heat if necessary. Simmer mixture for 10-12 minutes, stirring often, until cranberries pop and chutney begins to thicken. (It will get thicker as it cools.) Add pepper flakes if using. If you want to store it for several weeks, pack into sterilized canning jars and seal tightly. Let jars cool on counter before refrigerating. You should hear the lids ping as the vacuum develops. Or let chutney cool, transfer to refrigerator storage containers and chill. Should hold a week or more in the refrigerator. Sounds great, but how do you think this would be without onions? I’m trying to make Thansgiving dinner for a group that includes people who don’t eat onions, garlic, or dairy. Lovely in words and recipe. 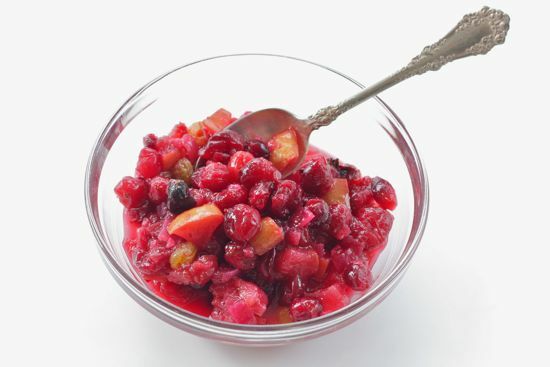 Pears with cranberries — sounds so good and right, and I never thought of it once. Looking forward to placing this on my holiday table. So enjoy your blog.